I've had the Bell's Three Nuns (Red) unopened in the tobacco bar for over a year now. My plan was: first gain a little bit more experience until one of the finest tobaccos will make it into my pipe for the first time. In addition to the Three Nuns Red there is the Yellow and Green. Both new tobaccos will be available in Germany in early 2019. We are allowed to pretest before it hits the market. Deniz and Christian have already reported on the myth Three Nuns. People have been critical about the price: it is significantly more expensive with 16.95 euros * for 50 grams than similar tobaccos. Of course, you can get first-class tobacco from Kiel for 12.50 Euro per 100 grams. The HH Mac Baren usually cost a little over 11 euros for 50 grams. In comparison: the Three Nuns is much more expensive with almost 17 euros - but still not really expensive - especially compared to cigars, which usually cost between 2 and 5 euros per cigar; even more than 10 euros for each cigar is quite common - unless you decide to go for the brand "itsaboy", wink. Sometimes a box of cigars can cost way more than 200 Euros. To put things in perspective: a 50 gram can for under 17 euros is a bargain. But how many times can you fill your pipe? The Three Nuns Yellow smells like the typical Virginia. The entire tobacco consists exclusively of coins. It almost feels too dry; therefore it comes into the pipe without airing it out. Three Nuns is made out of world-class Virginia Tobaccos from around the World. The tobacco burns wonderfully - but it has to be lit again; no problem. It's an old wife´s tale that a pipe should not go out. It may go out - especially if you still practice as a beginner and the pipe may gets too warm. Just let the pipe cool briefly, re-light, re-lax! The Three Nuns Yellow is supposed to be milder than the new Green. Personally I would classify it as 2.5 - since the tobacco is pure Virginia; however you must be careful that the pipe does not get too hot. My conclusion in the interim: do not be afraid of the big name! Actually, I'm not a huge fan of the pure-bred Virginia tobacco. Of course, I love Virginia tobacco, but also I like it with a hint of Burley, Perique and Latakia. However, I was looking forward to this "Yellow Sunday Pipe." The VAUEN 170 year pipe seemed like the appropriate smoking device. After 15 minutes of smoking, I had to take a small smoking break to let cool of the pipe. That is typical for Virginia tobacco: you have got to be careful that the pipe does not get too warm. Then the tobacco will loose its natural sweetness. Nuns Yellow consists of first Virginia tobacco from all over the world. It's produced according to old English tradition and offers a natural sweetness from the Virginias. Only hand picked Virginia leafs are used as wrapper leafs for this mixture. 16,95 Euro * for 50 grams: no bargain, but it is worth it. 5 - strong / (very) full. I am happy that I have finally ventured into the Three Nuns Yellow arena. This tobacco deserves to be classified as something very special. 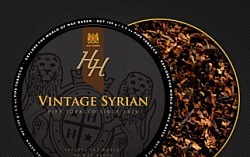 IMHO: every pipe smoker should give this tobacco a try -- and don't just test it once or twice ... Deniz will introduce the Green and I will take the Three Nuns Red to America. The Three Nuns Yellow can not dethrone the HH Burley Flake. However, it is not because of the quality -- but because of simply my taste. Burley Flake is absolutely my top tobacco from Mac Baren. We are excited about the new HH Balkan Blend. The next Mac Baren in the tests are two tobaccos from the Capstan series and the HH Acadian Perique. Rumor had it that even STG tobaccos are soon in our tests. Keep your fingers crossed - and your pipes not too warm.